Princess Ariel is a very talented girl with various hobbies. Shes a well-known fan of street racing and maybe the only princess who can drive a fast racing car. Shes keen on street dancing and hip hop culture, too. And of course, shes a popular media and showbiz diva, a frequent VIP to many private parties. So, lets take a look at her stunning fashion collection! 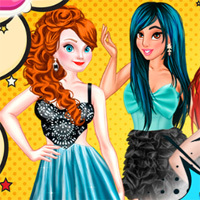 Ariel has got many stylish clothes from fashionable rompers and hip hop outfits to fabulous gowns. Lets try all of them on and enjoy three unforgettable looks of the princess!